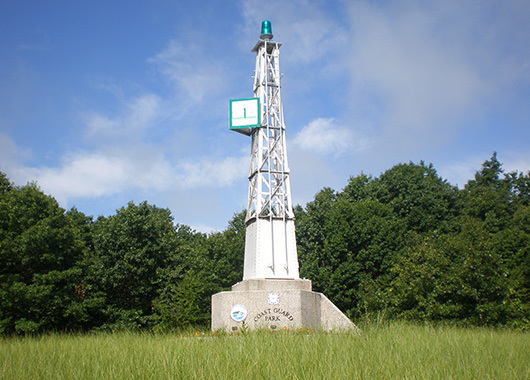 The Grand Haven area and Northern Ottawa County is one of the most historically significant areas in the state of Michigan, with its history dating back over 300 years ago. Imagine what the area was like in the 1700s and 1800s when fur trading and lumbering were king in West Michigan. Experience the history of the area by taking a walk along our 1.5 mile boardwalk that spans from downtown Grand Haven to Lake Michigan. At the end of the boardwalk you’ll see two lighthouses that have guided ships for years and whose silhouettes at sunset make the perfect backdrop for photos and memories. Meander through the Tri-Cities Historical Museum’s Akeley Building to learn the history through photographs and fun exhibits that will give you an old time feel. Continue your journey over the Grand River to Coast Guard Park in Ferrysburg. This park was once the shooting range for the U.S. Coast Guard and now provides an off-leash dog park. 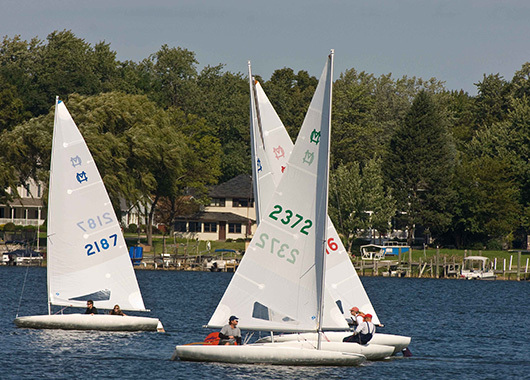 The Grand Haven area offers activities that are ideal for people of any age or background. Plan a family vacation or a romantic getaway for two. Some of the favorite activities and attractions for visitors and locals alike include: the variety of locally owned shops, unique and delicious restaurants, boat and trolley rides, a one-of-a kind Musical Fountain that puts on a nightly show from Memorial Day to Labor Day, historical train rides in Coopersville, and free concerts in Spring Lake at Mill Point Park and in Grand Haven at Central Park during the summer months. Be sure to take time to enjoy the great outdoor activities and parks that people have treasured for decades when visiting the area. 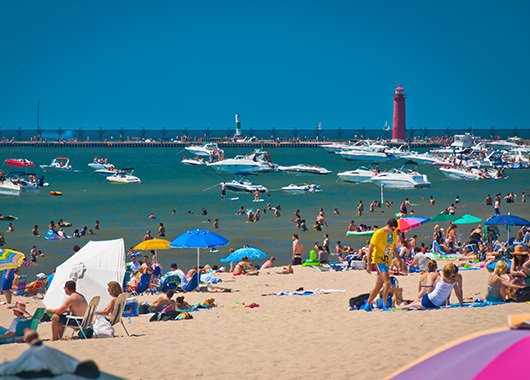 A typical day in the summertime includes beach-goers filling the sandy shores along Lake Michigan and Spring Lake, people relaxing and taking pleasure in the beautiful vistas and watching the parade of boats along with giant Great Lakes freighters navigating the Grand River channel. Although the Grand Haven area comes alive in the summer, there are still plenty of things to do in the fall, winter, and spring. Experience the beauty of a Michigan autumn with a bike ride through the trees with the leaves changing to vivid colors, pick apples and pumpkins, or go for a hayride. When the fresh beautiful snow and crisp air envelopes the area, go for a hike through the trails, rent skis or snowshoes or go sledding. You even have the opportunity to go downhill skiing at Mulligan’s Hollow which is an easy four blocks away from downtown Grand Haven. A springtime visit to the area brings with it a sense of renewal and revitalization as the trees bud, the flowers bloom, and kites fly. If you are looking to truly experience the area as it was so many years ago, just head north or south to experience more dunes, wildlife and wooded wonderlands. 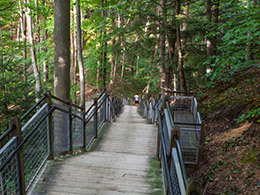 Rosy Mound Natural Area is a highly wooded dune preserve with a boardwalk that winds through the woods with 1,000 feet of stairs up and down the dunes. 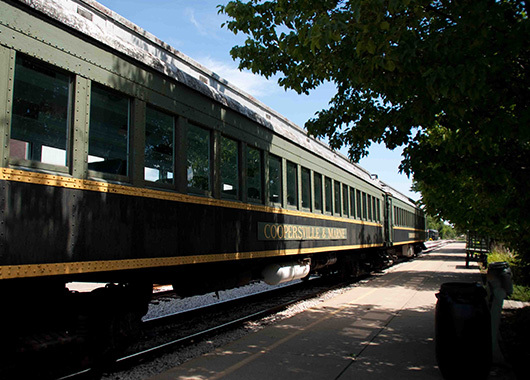 Go north of Grand Haven to enjoy P.J. Hoffmaster State Park and the Gillette Visitor Center. 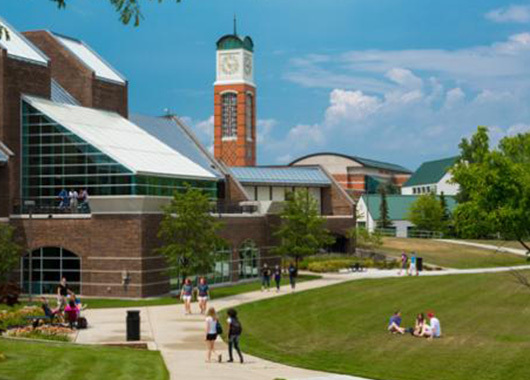 The park and visitor center offer plenty of hiking trails, views of Lake Michigan and the dunes, educational displays are ideal for enjoying a beautiful day in nature. Come and enjoy the environment that captured the hearts of travelers years ago and still does today.